Our team in New York City is bundled up and hitting the sidewalks to soak up all the merriment of the gift giving season. No other city on earth has shaped our image of Christmastime gift giving like New York City. The Museum of the City of New York is exhibiting Santa and the City to celebrate this century old tradition. The Christmas windows of New York City are a treasured part of celebrating the season of giving for many millions of people. Behemoth retail brands produce their very best creative solutions for inspiring gift givers to snap a few keepsake pictures and then put away their mobile devices and come into the stores. We went on a search to find great examples of brands that are highlighting a culture of philanthropy in their creations. 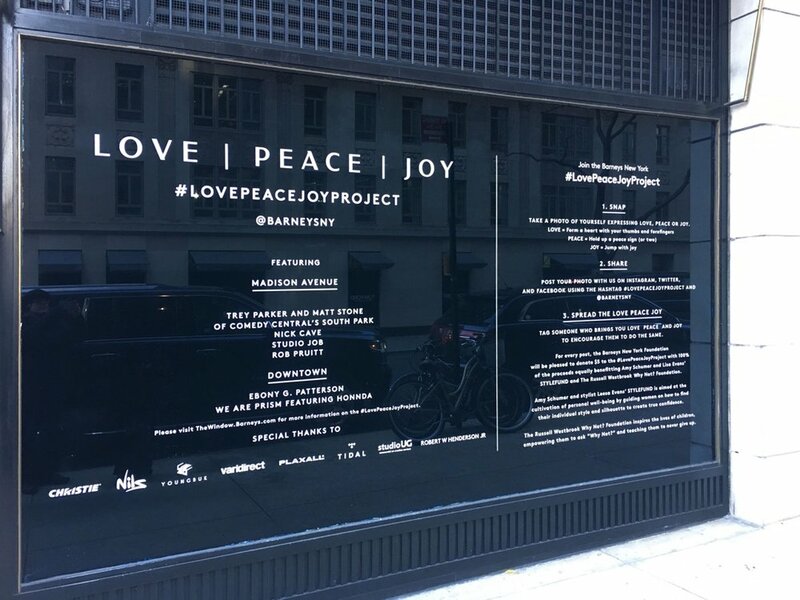 Barney’s New York is our favorite find for promoting a culture of giving through their #LovePeaceJoyProject. The brand’s long tradition of charitable campaigns in support of education, the arts and human rights drove the creation of Barneys New York Foundation. For 2016, the holiday windows are works of art. From the sidewalk, in the store and as the centerfold in the 2016 Holiday catalog everyone is invited to promote the campaign through social media. Barneys is donating $5 to Amy Schumer and Leesa Evans’ STYLEFUND and the Russell Westbrook Why Not? Foundation for every #LovePeaceJoyProject@barneysnyc social media post. Just a windy block away is another fine example of promoting philanthropic thinking in holiday shop windows. 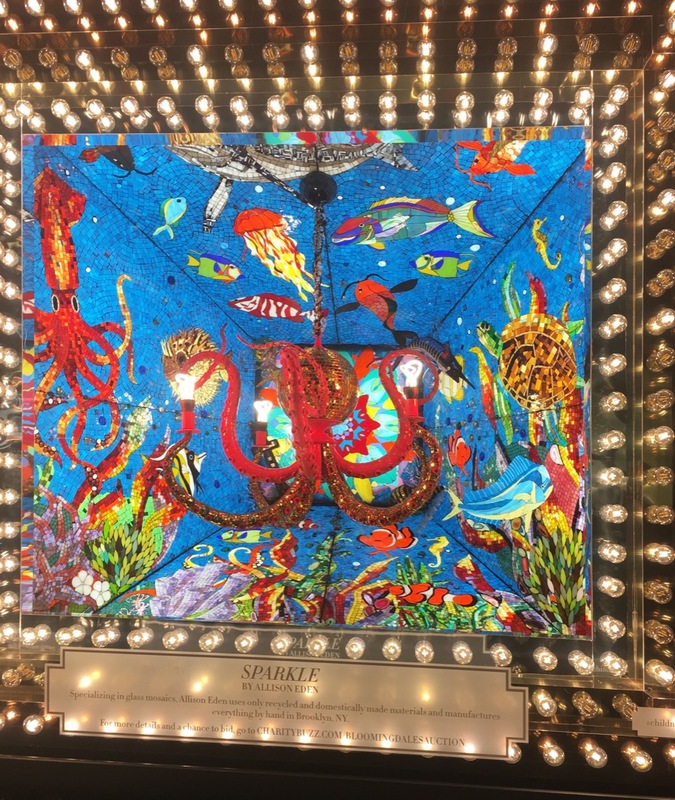 Bloomingdale’s commissioned eight artists to create one-of-a-kind chandeliers depicting ‘Light’ to serve as centerpieces of the brand’s See the Light holiday campaign. The chandeliers will be auctioned off at CharityBuzz, to benefit Bloomingdale’s longtime charity partner, the Child Mind Institute which is dedicated to transforming the lives of children and families struggling with mental health and learning disorders. Each window includes clear signage to promote the campaign and call viewers to give. Farther downtown in the trendy Meatpacking District we located our third example of a culture of giving smartly integrated into holiday marketing. Rachel Shechtman’s wildly popular shop, Story has reinvented placemaking in retail. Every four to eight weeks the store design and merchandise is completely revamped based on a new theme, trend or issue. For 2016 Microsoft Surface joined in for the recurring Home for the Holidays story. Shoppers receive tokens that can be redeemed for yummy treats on the sidewalk at Snow Day Food Truck. The truck is the creation of Drive Change, a New York-based organization that trains and employs formerly incarcerated youth in hopes of helping them find work and keeping them out of prison. Charitable calls to action in retail holiday marketing have increased over the last few seasons. We will be watching closely to see what models are used for consumer engagement, what philanthropic opportunities are trending in retail marketing, and how these campaigns are measured. We will share additional examples as we further explore the city. Please send us examples you see that are worth celebrating. We wish you a generous and grateful holiday season!